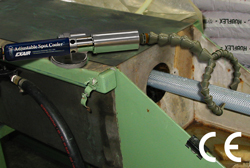 EXAIR's compressed air powered Adjustable Spot Coolers are a low cost, reliable, maintenance free solution to a variety of industrial spot cooling problems. With the turn of a knob, you can select the temperature best suited to your application. The Adjustable Spot Cooler provides a precise temperature setting from -30°F (-34°C) to room temperature. A swivel magnetic base provides easy mounting and portability. Flexible tubing that holds its position directs the cold air. No moving parts or CFC's assures maintenance free operation.